One of the annoying things with a non-jailbroken iPhone is the lack of tethering. Tethering is the ability to use your 3G-enabled phone and its Internet connection with a computer. When I am on the road I find times it would be helpful to be able to tether my Droid X to my laptop but not for the $20/month Verizon changes. I was put onto the application known as PdaNet. The application consists of a piece of software that runs on the Android phone and a client which runs on the computer you want to make use of tethering, both Mac and Windows clients. The directions from the June Fabrics web site are pretty good but were missing a few details I stumbled over the first time I tried to set this up. Maybe if I was a long-time Android user I might have not had any issues. So, the steps I used to setup tethering of my Motorola Droid X to my MacBook Pro. 1. Install the Desktop Client – visit the June Fabrics web site and download the Mac client. I am on a Mac, as I said, but a client is available for Windows as well. The installation was fairy straight forward, requiring a reboot to complete the installation. 2. Install the Android Client ? 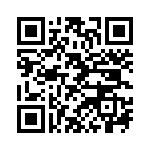 install on the phone, grab the app from the Android Marketplace. 3. Enable Tethering ? 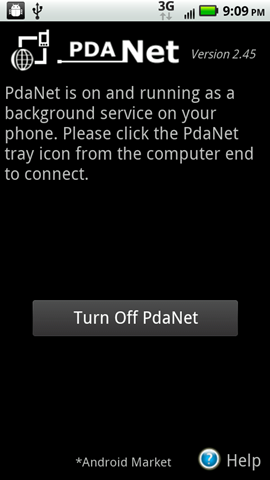 run the PdaNet application on the phone and select ?Enable USB Tether?. Turning it off later is pretty simple, just run the software on the phone again and you get only one option. 4. Enable USB Debugging ? on the phone, go to Settings->Applications->Development and check "USB Debugging". 5. Configure USB Connection ? this is the step that had me scratching my head. 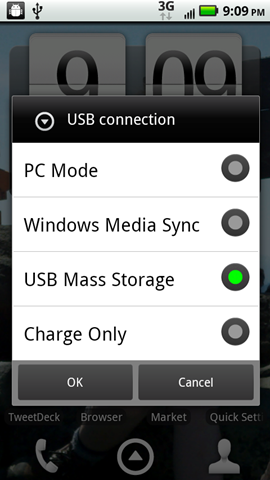 As you should be able to see, the selection here says ?USB Mass Storage?. This is key since the default ?PC Mode? does not work to tether the phone. 6. Connect the Phone ? armed with your phone to USB cable, plug into the USB port of the Mac. 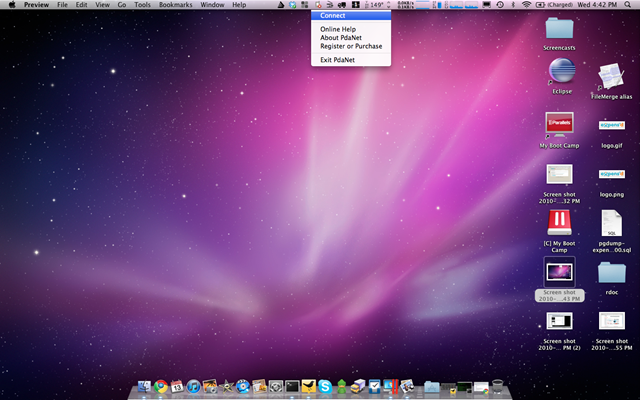 Now, if all goes well, visiting the PdaNet menu on the Mac now finds the phone. Now when you connect your phone to the computer, you should see the menu icon changes state, click on it to connect. When the icon stops blinking and turns blue, your computer should be online. Network traffics on the Mac will go through PdaNet only if your system does not have other connectivities. So, if you are testing this out and are connected via Wi-Fi or an Ethernet cable, it will still go through these connections. Disable them to test. The bottom line is, it works. It isn?t exactly fast but gets the job done and does it well. 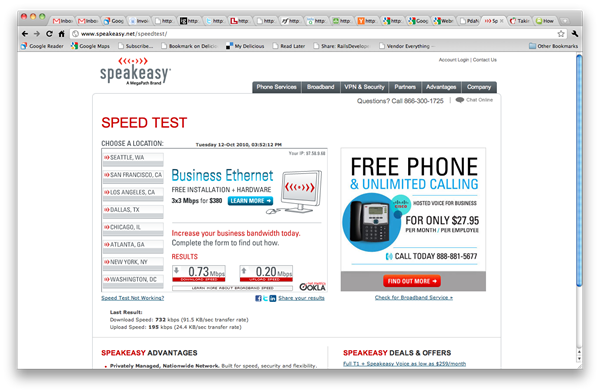 You can see the results of the speed test from Speakeasy.net of my tethered Droid X.
I would like to know what folks are getting for speed from their Verizon Mi-Fi. This will certainly work and for most things like email, Twitter, blogging and less bandwidth-intensive jobs, it will work well. This blog post was a lot harder to write than I initially expected. I wanted to not come off biased against either platform but offer just a view of my hands-on experience with both devices. I have been using the Apple iPhone since the first generation release and have been very happy with it. Apple has done a great job with the iOS mobile platform making their phones a pleasure to use. Apple has failed (for me anyway) in a big way, by partnering with AT&T which makes the iPhone virtually unusable as a phone in the places I need it most. I have lived a long time with the iPhone, buying the 2G first and then later the 3GS, hoping the weak signal issues I faced would be resolved, but this was not the case. I also waited a long time for the rumors of iPhone on Verizon to appear but they have yet to materialize. So, I have bid a farewell to the iPhone for the time being and moved to a Google Android-based Motorola Droid X on Verizon. When the Motorola Droid X finally arrived (3 weeks after ordering), I spent a lot of time comparing the new phone to the iPhone. It concerned me what I might be giving up or maybe what I had gained with a new phone. After 3+ years with the iPhone one becomes used to things. I was told how large the Droid X was and listening to podcasts from Android Central, I had definite doubts that I was getting into a phone too big to be useful. I often carry my iPhone in my pants pocket and this was something I still wanted to be able to do. I took a trip to my local Best Buy so I could compare the Droid X to my iPhone. I was surprised to discover the Droid X was only slightly longer, maybe 3/8?. This is a big phone, no doubt but the 4.3" screen makes it worth it. 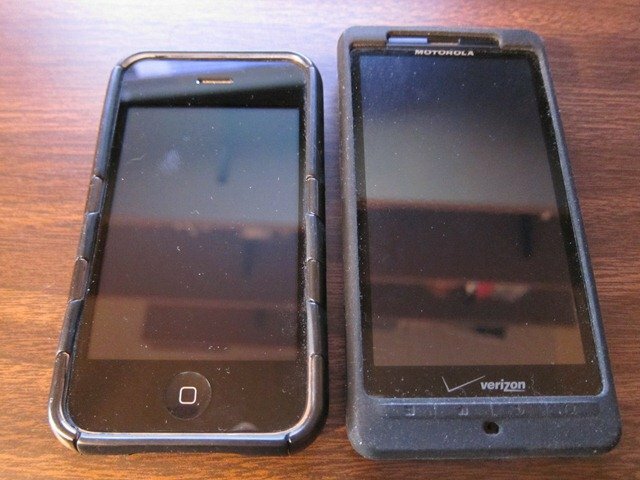 The thickness of the Droid X is less than the iPhone 3GS, so it is a bit easier to manage. This is a nice feature of the Droid X. The iPhone with case is a bit bulky. The iPhone 3GS has a beautiful screen and watching videos on it are really clear, but small. The 4.3" screen on the Droid X is big and beautiful and watching movies is a pleasure. I find the colors to be vivid with good contrast. I can’t compare to the iPhone 4 retina display. iOS does a great job of managing switching between applications and battery life benefits from this. I can go all day of average use on the iPhone and still have 40% battery life left. The story is not so bright with the Droid X. It takes a lot more management of running applications as well as management of enabled features to be able to last well into the day with a single charge. If features such as GPS, Wifi, bluetooth or 3G are all enabled, battery life is only a few hours at best. Disabling all or some of these features helps the battery go a long way. Battery life is greatly effected by the running applications and how often they access things like data or graphics. It is easy to have email, Twitter client, Facebook, etc. running all at the same time. The main applications I use on my iPhone is Gmail, Google Maps, Twitter, Facebook, Yelp. All of these application are available for Android. There are many more applications available for the iPhone as I would expect with such a big lead in getting to market. Android is catching up though and developers are busy creating great stuff. It seems many of the non-mainstream applications for Android appeal to geek in me. Functionality of software is the number one priority for a good application but the user interface makes it a great application. iOS does have a distinct advantage here with a much richer set of controls for developers to use and the applications they create show it. I think the market is young and Android will look better as time goes by. 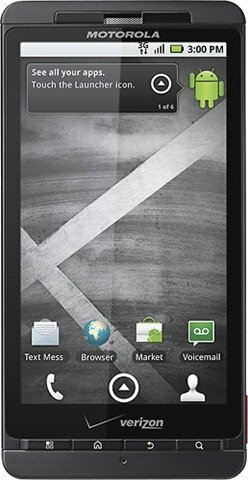 The Droid X arrived with Android 2.1 where other phones were shipping with 2.2. The interesting fact about Android phones is each vendor is responsible for their own operating system updates for each handset they offer. I had to witness 3 different Motorola phones getting 2.2 before I could upgrade mine. Apple on the other hand rolls out a single upgrade for their phones and everyone gets it. Updates are done over-the-air, which means there is no iTunes-like piece of software to have to run to install an update. The update comes over Wi-Fi or 3G. Android phones do have a sort of jail breaking that we see on the iPhone except it is called ?rooting?, which allows for installing an OS update before the vendor has it ready. This skirts the process and allows advanced users, geeks, to upgrade more often. There are a ton of Android-based phones in existence and more coming out all the time. Each handset manufacturer ships their own version and flavor of Android. Each manufacturer is responsible for upgrading each handset model to the next version of Android..or not. This doesn’t seem very sustainable to me. I think phone buyers who are signing into a 2-year contract will be left with a phone which is no longer being upgraded by the end of their contract. Fragmentation seems like a very real possibility and a problem for Android. In the short time I have been an Android user I have seen many versions of Froyo (Android 2.2) be released for a large number of different handsets. My installation of Android on my Droid X will not work on your HTC handset. How will these manufacturers keep up and support all these phones? It would be akin to Microsoft having a different version of Windows for each PC manufacturer. It is a support nightmare waiting to happen. After having had the Droid X for a couple months now and have given the phone a pretty fair test. One thing I can say the Droid X does better over the iPhone is well…operate as a phone. This is the number one feature I require in a, you know, phone. It is the one feature I could not count on with AT&T and the iPhone. I live in rural CT and the AT&T service was never good at my house, if I was lucky I could go outside on a clear day and make a call. Verizon service just works every where in the house, even 3G. On a recent vacation in northern New Hampshire AT&T service was dismal and virtually non-existent. A later trip to the same location for some backpacking with the Droid X resulted in fantastic service. I spent a lot of time comparing applications and the user experience between the two operating systems and I have to say, iOS is much more polished than Android. Android looks much less integrated and thought out than iOS. Android gives me the impression a collection of separate teams worked on the operating system, not a single cohesive team. Battery life is a pretty serious problem with Android whose battery management is not as sophisticated as that under iOS. This means the user has to know what they are running for applications or what services they have enabled. This is not something an average user can or should do. The iPhone easily wins here. Android is nice but it is not iOS. I am waiting for the day Apple finally puts the iPhone on Verizon, I will be the first in line to order the Verizon iPhone.